Summer after summer, I have the same ambitious plan to hit up every single Chicago festival and concert possible... and it's almost always a total fail! 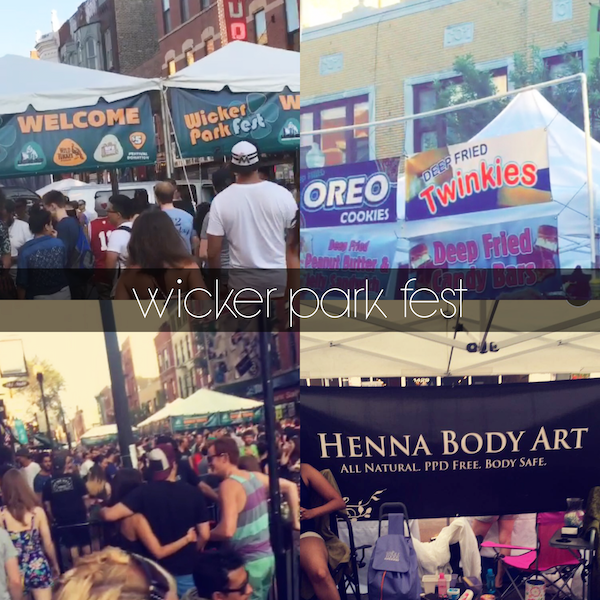 So last Friday when I saw that Wicker Park Fest would be taking place the following day, I made it a point to go check it out. Not only did I have a good time just being able to hang out with my best friends, but there were some pretty cool vendors there as well! I wasn't brave (or crazy) enough to try out the deep fried twinkies or candy bars but I did get a pretty awesome henna tattoo! I also really enjoyed just checking out all the beautiful art and jewelry being sold. I even picked up an awesome bracelet before I left and I'm so mad at myself for not taking down the store's name so that I can buy another one! Overall, I just love the atmosphere of street festivals during the summer and so I'm glad that I finally got to experience Wicker Fest! Looking for some festival fashion inspiration? Check out what myself and a couple other bloggers are wearing over on Chicagoings.com! Oh and on Tuesday, I went to the J Cole concert and of course....took no photos. In my defense, I had lawn tickets so the photos wouldn't have been great anyways! I'll also be going to the Chris Brown concert in a couple weeks at the same venue. I didn't find out until recently that Groupon has the #DEALZ for concert tickets! So glad I did, because I got both of my tickets for only $20 each! So at least I can say I'll have 1 festival and 2 concerts under my belt for summer 2015..I promise I'll do better next year!